Staying at The Montcalm meant that this ^ was my view the very second I exited my hotel. No time to take a deep breath - it's a case of dive straight in - but I paused from pushing the buggy to take the above pic, as you do.... I'm a blogger ... but first and foremost, as always, I'm inherently an archivist too, so it's in my blood to try to capture everything, be it in notes or photos (or pre-baby my brain, as I used to have an AMAZING memory *cries at the loss of it*). I swear though, I must have worked in a museum as a curator in a past life. ... BUT the hotel porter took it and he even took two... BUT they are not at all flattering, so on my camera phone they will remain. Hey, I like to share but I do have my limits. I was feeling very wobbly on arrival. I didn't think I was a stickler for routine or the sort of person who is thrown by something being different, but just because registration was upstairs for the first time ever and they couldn't find my name badge for the first time ever, I was just about to break down in tears. BUT an absolute bloggy angel who I've known for years came straight up to me, the gorgeous +Charlotte R.B who my very own Lottie shares a name with. Thank you gorgeous lady. She's pictured to my right. Charlotte blogs at Berice Baby. 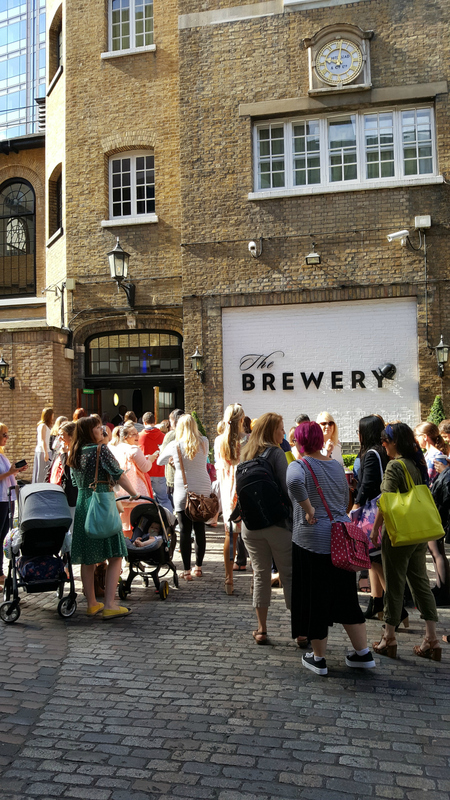 At BritMums Lives in the past delegates have been majority "old timers", minority "newbies", so you'd literally walk around feeling like you knew, or recognised everyone at The Brewery. I've attended 6 times in a row (I know it was Britmums' 5th birthday but there was Cybermummy at the Brewery beforehand). But for the first time ever, I actually felt like the newbie and definitely us old timers were outnumbered*. Thankfully I was never more than a few metres away from a smiley face that I DID know. Also, being that Instagram's my new favourite platform, sometimes the person you know is someone you haven't met in real life before, but you feel like you see them everyday. Like Essex Kate (pictured on my left) and her precious baby Sophie for example. Kate is on Instagram here: Essex Kate which reminds me I am yet to check out her blog Counting to Ten. *of course I do not know if the statistics back up this gut feeling. Now the lady in this picture, Nadine from Juggle Mum, very much deserved this hug for so so so many reasons, not least of which was the fact that she single-handedly FOUND my name badge. A seeker of the badge who succeeded where so many others had failed, despite the fact she was so busy with so much to do. She's been my saviour in recent weeks too. Thanks chick you rock! She's also the BritMums.com editor so do check her out! 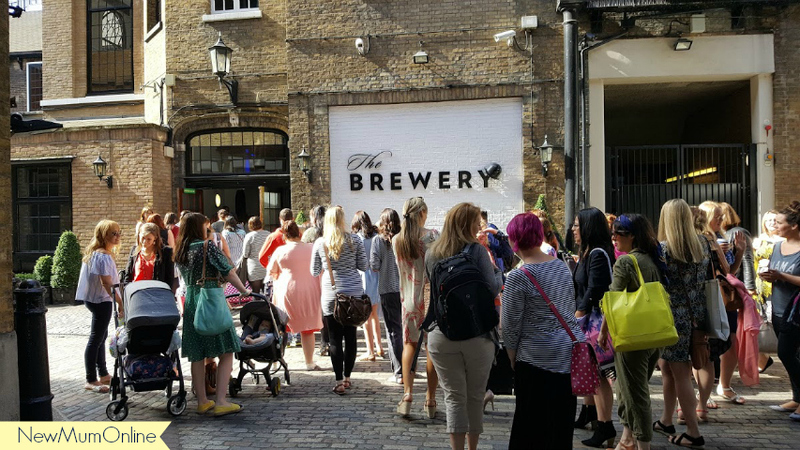 Even back in the days when ALL of my bloggy mates would be at BritMums Live I never did stay in a group with them all day/days, nor did I move around with them like a school of fish. I'd always break out and wander round the hub or go off to the toilet and as a result I'd always end up meeting someone new and getting absorbed in a chat that otherwise wouldn't have happened. So given that I am independent in this way, it shouldn't have been no real big shakes that a lot of my old bloggy buddies were not there, BUT sometimes it did mean I felt lonely in a crowd, a feeling made worse by the lack of sleep (I *always* get weepy when tired). 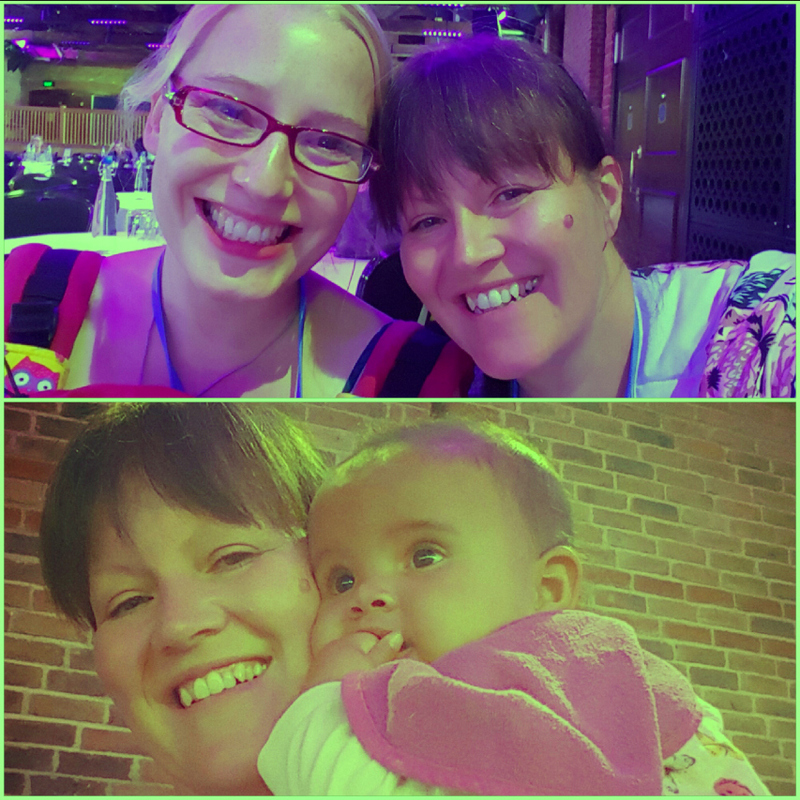 One person I have sometimes been stuck like glue to at BritMums Live and Mumsnet Blogfest is Jenny and Jenny you were missed. The night before, i.e. 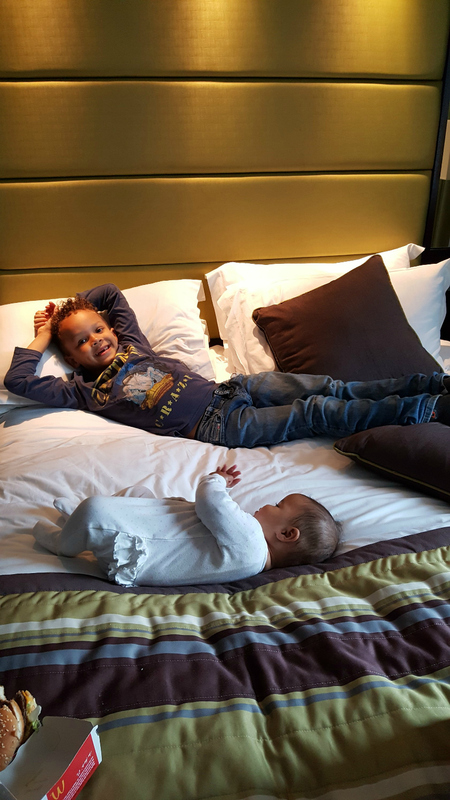 BML16 "eve"
I had insomnia Friday night even though I skipped Fringe drinks, so as to rest and fully enjoy The Montcalm with my lil family of 4. Also, why stay near The Brewery only to travel over and back to Camden. I couldn't face it, or the logistics of bringing Lottie or the worry of leaving her behind when breastfeeding. 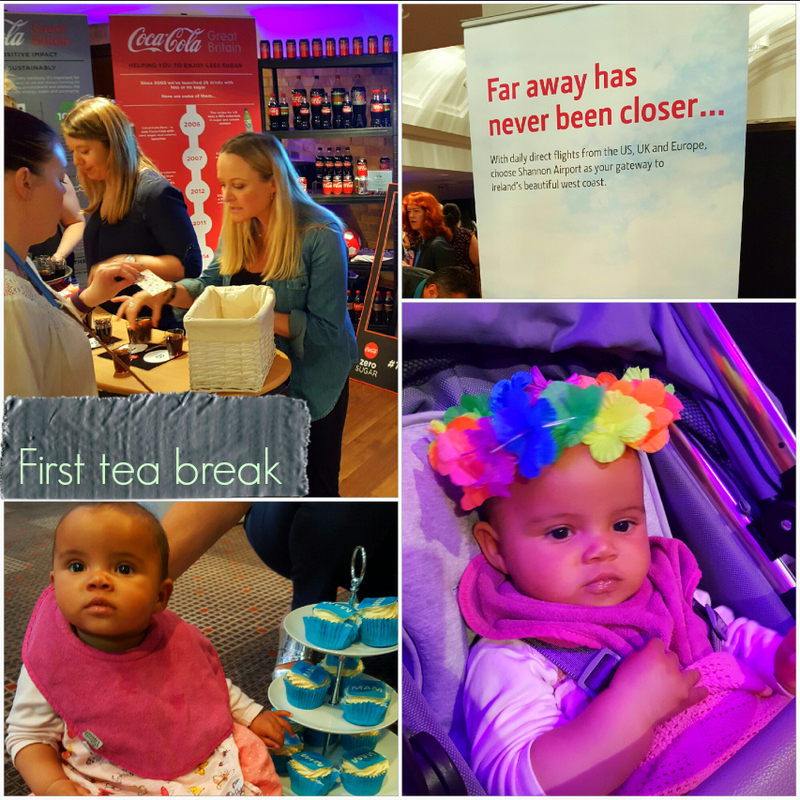 After leaving home at 08:30 to arrive at The Montcalm at 13:30 to meet Coca Cola at 14:30, I needed some down time prior to a busy day ahead where BritMums Live would be trying to achieve in one day what it ordinarily does in TWO. BUT alas, despite going to bed at 10 p.m. I slept at 3 a.m. I couldn't even get up and make use of the time as everyone (Lottie, Aaron AND Daddy) was asleep EVEN night owl nocturnal Daddy. So, I just lay in bed vicariously following the night-out exploits of people who were story telling their fun evenings on Twitter and Instagram. Even continuing to do so into the early hours. I think the reason I had insomnia is I was BUZZING after a mind blowing symposium (what even is that?!?!?) with my great Sponsor for #BML16 Coca Cola that was held on the Friday afternoon. We (myself, Michelle Purple Pumpkin Blog, Mari of Mari's World, Claire of Evans Crittens, and Al from The Dad Network) even got a goodie bag as if they hadn't done enough for us already (train tickets, room in The Montcalm and ticket for #BML16). ... 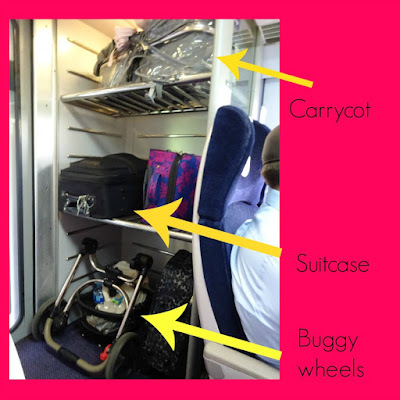 I was left to negotiate the mystery that is: where do you put a buggy on a train? I hadn't thought this one through, so I did THIS. Clearly this only works if you board before everyone else and literally HOG the luggage compartment. Luckily the overhead areas are so generous, people tend to avoid this shelf area as it is too far from their seat and too near to the doors. Had this not worked I am not quite sure what I would have done. Once the buggy was ensconced in there, which was really the only place it could go, I then had to jiggle, bounce and feed Lottie on my knee, which was easy on the way to London, but not so easy on the way home when I really wanted to have my table open. Luckily on the way home the lady who checked our tickets took pity on me and gave me complimentary "stuff". The journey to London was easy enough, as Aaron spent it drawing on the tablet - I was so impressed with his creations. The journey back, he was watching Goosebumps on his portable DVD player. He's always been a good traveller to be fair, which gives me one less thing to worry about. But back to the event eh! The bottom right hand side picture of Lottie above may not be flattering but I had to include it as her blowing raspberries always at the most inappropriate of times was one of the highlights of the event. Whether it was just as someone was collecting their award, or just as I was about to burst into tears, it was a frequent and noteworthy occurrence. One of the opening keynotes was Anne-Marie Cockburn talking about the loss of her daughter when she was only 15 years of age, having been taken too soon at 5,742 days which inspired the title of her book: 5,742 days: A Mother's Journey Through Loss. Now I have been waiting for Lottie to arrive since 1989, so to hear of the loss of a young beautiful girl in her prime, when my Lottie is only 5 months, was just too much to bear. I was literally JUST about to totally unravel all over the place in a puddle, when Lottie saved me with a raspberry. Judging by the looks on the faces of those nearby, I think she helped them too. Some emotions take you to the edge of a cliff and I wasn't quite ready to fall off, not with the big bag of emotions I was already in charge of that day. Sometimes it is nice to connect with someone on Twitter, so if these words have touched you, dear reader, or are relevant in some way Anne-Marie can be found on Twitter here: 5742Days. Pass the Parcel was a great ice breaker. At the outset the person to my right (if you are reading this, please remind me of your name as I spoke to you several times in the day) was about 4 seats away so I had to literally receive the parcel and then throw the parcel... but then lovely Kerry from Oh So Amelia joined us to my right and all was cool! Until, she got pass the parcel and we all loudly cheered only to wake Lottie up - doh! The 10:15 break was really appreciated as it was my first chance to access the hub (the place where the tea/coffee, pastries and cakes are) and the place where you mingle with peers/brands. I hadn't spent my usual 30 minutes in there eating breakfast pre-event, as upon arrival me and buggy were shepherded to the lift as registration for the first time ever, was UPSTAIRS. ONLY TROUBLE was this break was 15 wee minutes long, which considering you've had to come downstairs from BritMums1 wasn't long enough. I don't wear a watch and it wasn't always convenient to keep getting my phone out, so I arrived at Storytelling and Storyboaring for great videos - sponsored by Mam about 15 minutes late. To be fair I walked passed the room it was in (just off the hub) a few times but I didn't realise that the door being shut meant it had already started - doh. Thankfully they DID let me in late, but the wonder that is Nigel Camp did not have a microphone and unless you were sat on his knee you could not hear him. Despite being a lounge it was standing room only so I sat on the floor to breastfeed Lottie. I was near the cupcakes though so it was sound as a pound. 11:15 saw me have a choice. I had to choose between a travel blogging session and 10 ways to tell compelling stories with photography with Charly Dove. 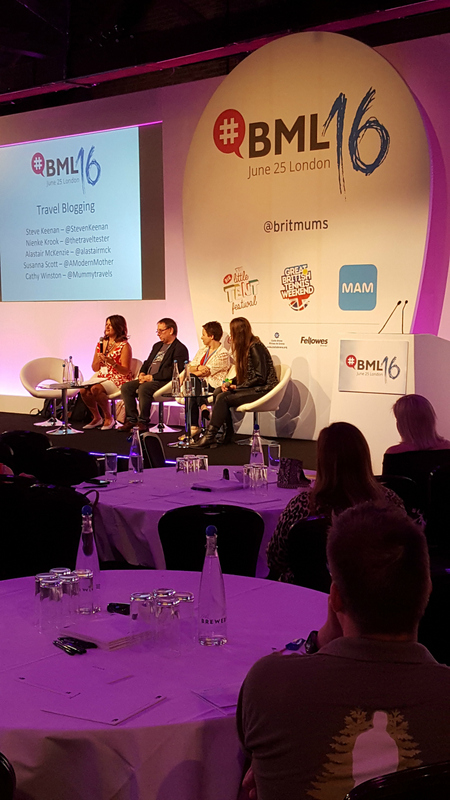 Now everybody knows that EVERYONE is now into travel blogging which I guess is why it was held in the main "BritMums1" room hall, but the room was far from full and the energy was flat. I had so clearly chosen the wrong session and a quick glance at Twitter confirmed the same. Just as Susanna (the co-founder of BritMums) was about to speak last (why?) on the travel blogging panel, we were already out of time and the speakers for the next session were already hovering. Susanna was saying interesting things that I wanted to hear, but that was it, the session was over. The only take home point from the session (without consulting my notes) was that Facebook Live has catapulted itself above and beyond anything that G+ is doing and that people get way more (immediate) views on there than they ever do/did on YouTube. Oh and that on Pinterest, the travel pins that get the most interest are the ones about Ireland. Now that's an awful shame, as I used to go there 3 times a year and now budgets dictate that I hardly ever go, despite ALL my family being over there (yes I have about 15 relatives here in the UK but my Mum and everyone else is there). Can I take this opportunity to say how spooky it was, that given all of my family are from the West of Ireland (both on my Mum and Dad's sides of the family) that there was a chap from Shannon Airport exhibiting in the hub! You can see his banner in the collage above. ALSO, the FIRST person I met upon arriving at The Brewery and The Montcalm on Friday afternoon was Cuddle Fairy and she also lives in the West of Ireland, not only a hop and a skip from all my relatives but also near where I got married. I was naughty, I took a picture of Cuddle Fairy before even hugging her or saying hello. The next session was Up Your Game - Innovative Ways to Make Money. By this point I was so over the whole panel format, so I only stayed in the room for monetary reasons and the fact that it involved being able to stay where I was. Now I really must go get my notes as I think I did here write some things down. Natasha Courtenay-Smith author of The Million Dollar Blog (which I had not heard of and must now buy, except it is not out until September so has to be pre-ordered) spoke about several blogs she has featured in the book including A Beautiful Mess. A Beautiful Mess is run by sisters and they earn "$2 million revenue per year". But they get revenue from "everything and anything" linked to their brand/blog but not necessarily blogging itself. They have books, are available for "speaking" and do affiliate marketing. Next mentioned was Madeleine Shaw who does "little sponsored content as her website is PURE". Honest Mum said it's not just about sponsored posts and display ads; lots of brands pay you to make videos. I hope someone has blogged this session as I am sure lots more was said but I had a bouncy baby on my knee who eventually, after a lovely cuddle with Natalie Trice (pictured centre of collage), did go to sleep. This session started slightly late, so ended late. Unfortunate as lunch was next and I was starving. My milk supply is not great without eating and I'd not had breakfast. I became like a juggernaut, steaming through people, me and baby/buggy in an effort to get to the food by the quickest route possible. I knew I wanted to inhale my food so took myself off to the bar stools in the Tent lounge and ate alone so I could drool and gobble. There was lots of food left over so I ate 3 pots of main meals. Actually wished I eaten even more. I also took the lunch break as a quick chance for a nappy change and got chance to chat to other Mums whilst waiting to use the disabled toilet. Actually I think this was the one chance I got to speak with Mummy Daddy Me and meet her new little boy who I see everyday on Instagram. As you can see Lottie has a long sleeved vest under her dress so was warm in that way, but I could no longer cope with her cold legs (all rooms were air-conditioned) so I took this opportunity to do a wardrobe change :-) and get tights on her. Like myself I should have changed her for the Bibs again one more time to justify the 12 outfits I carried around all day in the nappy changing bag. Although of course you never really carry a nappy changing bag as it is just hangs on the buggy. I begun the morning with my lovely Hush Cush portable nursing pillow hanging also from the buggy but I was so embarrassed that night to see it had splatters of what looked like breastfeeding poo on it. I wracked my brain and figured they must be splashes of coffee and someone must have spilled one near me. So even though I went around thinking buggy and baby looked lovely, people were probably looking and thinking euggghhh or yukkkkkk! Then two things happened - Lottie fell asleep and I went to the panel session on Instagram, knowing 3 of them very well on Instagram, I felt safe it would be good and was not disappointed. Follow @soGoodinEveryWay on Instagram - tick! Check out @CoCoInMyKitchen on Instagram - tick! When doing sponsored posts on IG, charge approx £100 per 10k followers - errrm that rules me out then at 2.3k followers but I only joined Instagram April 2014, it's a work in progress. Diana has always been one of my fav Instagrammers @paintsewgluechew and she said she spends anything from 20-40 minutes posting, commenting and liking. She is very reciprocal in her approach and I personally know this of her. She said to be generous and genuine and that she most certainly is. Maggy spoke of having a tribe. 200 people you regularly interact with. This is where I have gone wrong since 2014. I just haven't had time for that and it shows. She said on Instagram she has identified about 50 really like minded people. Which brings us to the question of lists. You can do this on Twitter but not Instagram so how do you find your favs. Hashtags that's how! They also mentioned the following two great IGers: Circle of Pines and Ali Dover. But I cannot find the latter. They mentioned VSCO but I do not know what that is either. They discussed the very best times of day to post but I think I was distracted with Lottie at this point, but I think they said early morning and 7 p.m. and late at night work well. Midday does not. I love how they operate the hashtags with guest judges etc... I can't wait to participate. When working with a brand accept a reduced fee until they get to know you, your brand, what you can do and the standard of your work. So prove yourself capable for future projects. 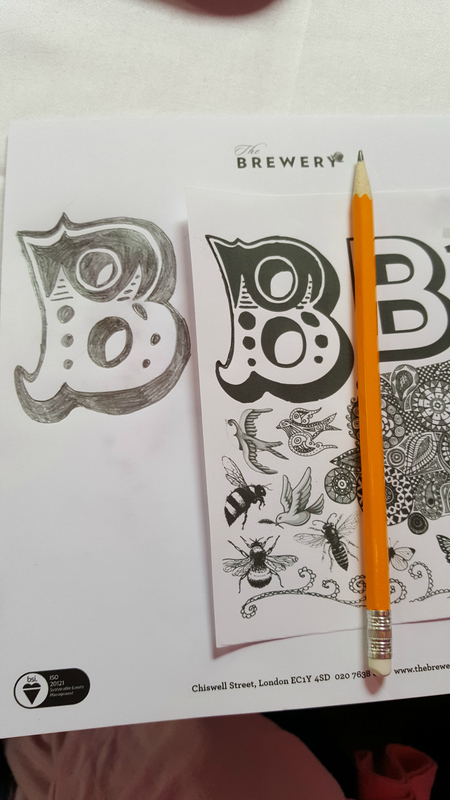 Approach the brand with your idea as it may not be something that they have thought of doing. This also reminds me that it was in (I think) the travel session, when someone said that P.R.s move around, so do accept a review of something small as the next time they approach you, they could be in a bigger/better agency or working for a bigger/better brand. In my years as a blogger I can't tell you how many times this has happened but it's lots. or now real life Lottie. Now it was time for a chat with Cherry Healey - I could hear that it was very funny but I was very distracted so not really listening. I cracked open a can of the new Coke Zero from my lovely sponsor and waited for the Bloggers' Keynotes having finally done my #BootsSoltan photo booth GIF downstairs before coming up to the main BritMums1 hall. It was lovely to meet Oh Little One Sweet and baby, pictured in the collage, on my way into the hall. I was sitting with Essex Kate so our baby girls got chance to meet once again :-) She gave me the idea of changing Lottie on the floor amidst the tables, which actually worked very well. The two girls then became SO fidgety (for the first time that day bless them they'd been sooooo very good) that I decided to put my pink blanket on the floor and let them have a little stretch and play. Lottie has never played with another baby so she didn't really know what to do bless her. They mainly just tugged at each other and looked amused that we'd put them down there for a couple of minutes. 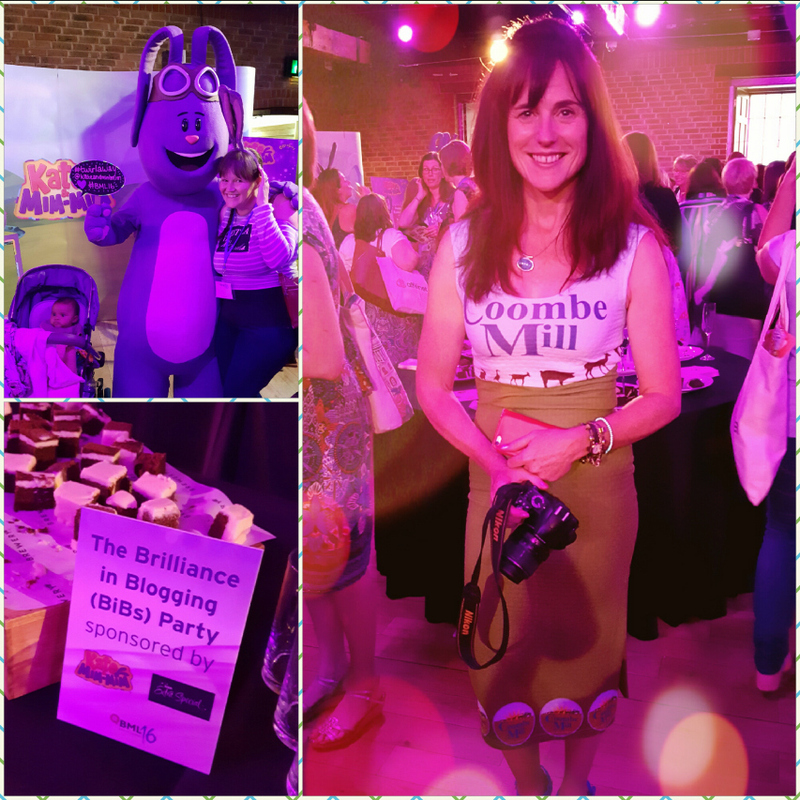 Next up was the Bibs Party which I attended ever so briefly before rushing off to feed Lottie. 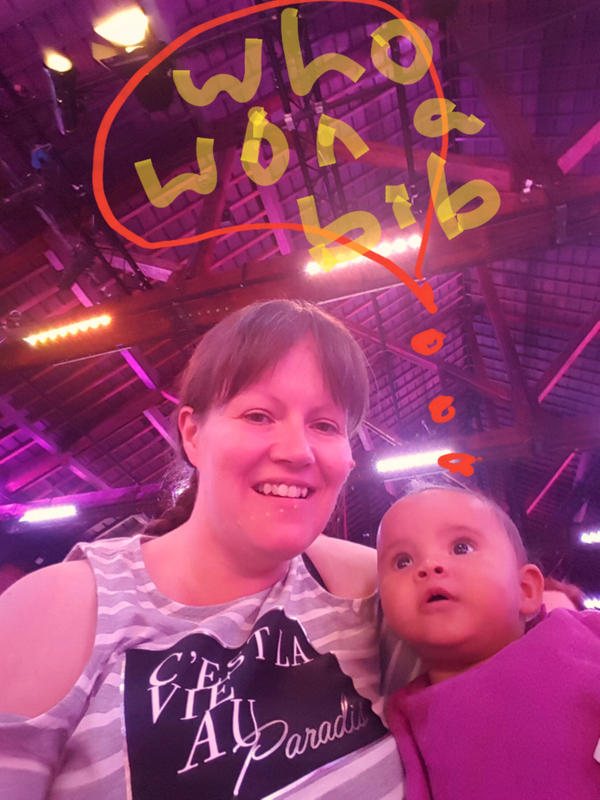 I did get chance though to meet a Mim Mim and Fi from Coombe Mill who little did we know was about to win Reader's Choice in the Bibs Blog Awards 2016 - look at her she is literally wearing her brand on her dress. AWESOME!!!!! Every single Bibs 2016 award being collected is uploaded to my You Tube channel - all 14 awards. Take a look: NewMumOnline YouTube channel. I was lucky enough to spend the Bibs sharing a table with the Welshies :-) Kerry Norris on the RHS and Leanne Cornelius from A Slice of My Life Wales in the centre. They were so bubbly and sweet. 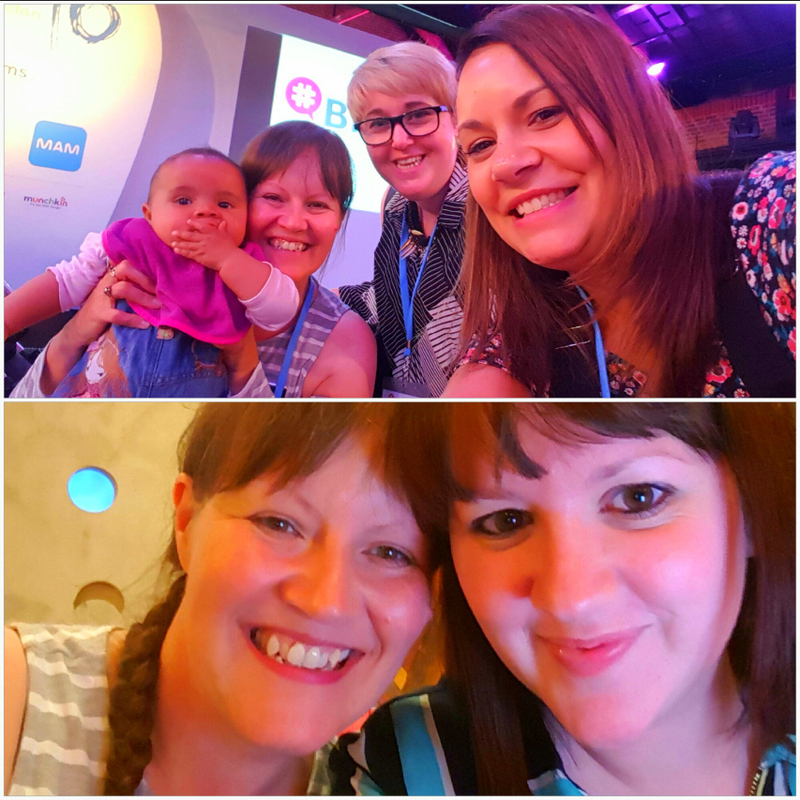 I also made a friend in Sarah Forget Me Knit, also at the same table with us but from Bristol - she's in the bottom pic of the collage and we also sat together at the group meal in Nandos after #BML16. There are LOTS more pictures of the weekend which I will add to a G+ album and of course there's already LOTS for you to look at on my current NewMumOnline Instagram feed too, all tagged with #BML16. I would like to thank The Montcalm for a lovely stay - here is a partial tour of our room and Coca Cola for so generously sponsoring me (my travel, my accommodation and my #BML16 ticket). I've added this post to the I Was There Linky. P.S. 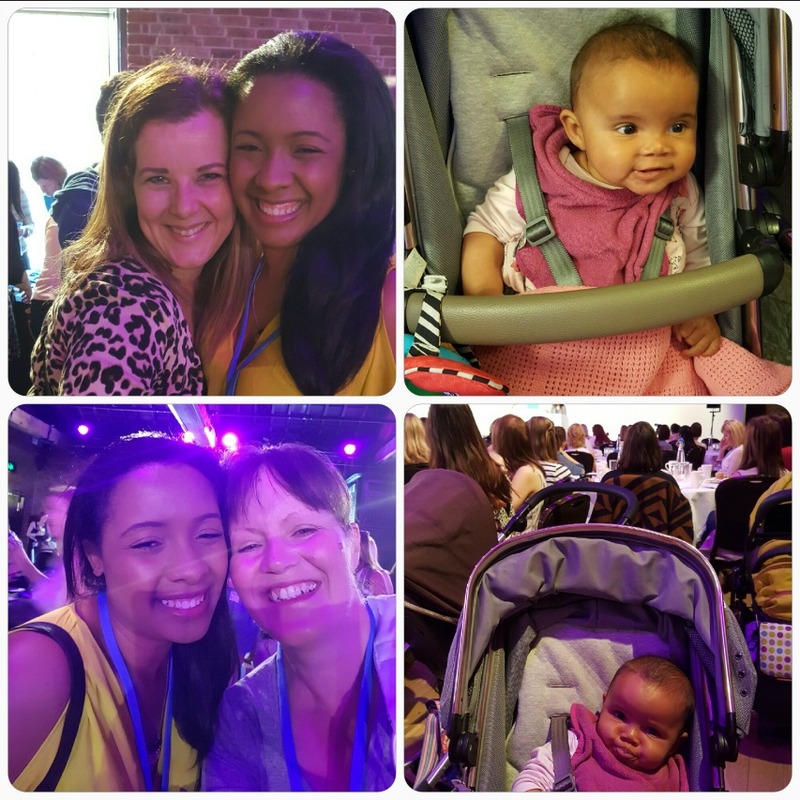 you may say "what does a 5 month old baby get from being at a bloggers' conference?" Well for one she was adored and giving heaps of attention all day. But, apart from that, she got to meet a Clanger AND Mim Mim. What could be better :-) We even had a Mim Mim in our goodie bags and The Boy and Me's son has LOVED his. 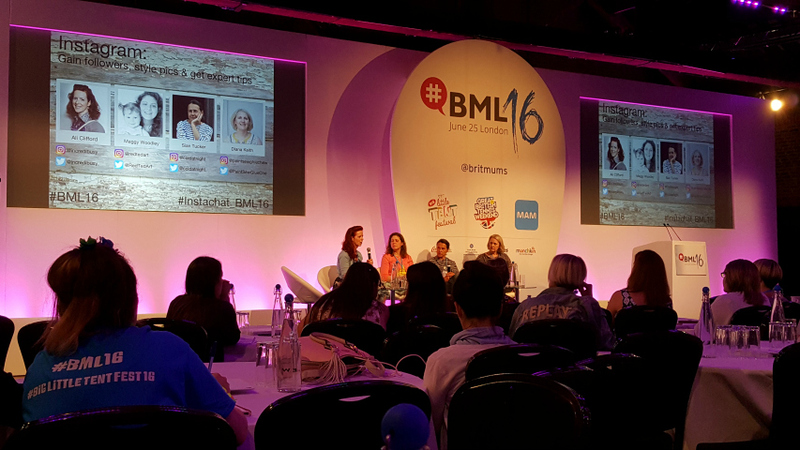 You were right - this is the longest post about BML16 that I have read! I knew it would be you when I saw the title from the Brit Mums linky! I am amazed how much you have taken in of the day, with baby in tow as well - you champ. I was not myself at all during this event, and spent half of it outside with friends chatting. I hope to be in fighting form for next year! It sounds like you had such a wonderful time...This was such a great read. hello lovely, thanks so much for coming along to the session, good to see a friendly face! Finally got round to reading this! It's been a long week. It was lovely to meet you two and i'm glad you had a good time. Lots of great pictures in your post and reading it is bringing back memories. Was it really only a week ago?